SALT LAKE CITY — The 2002 Winter Olympics provided remarkable opportunities for Salt Lake City and the state of Utah while giving the region a facelift in its international image. Five particular faces, however, helped give the city and state such an appearance, whether it was on ice skates or in Rice-Eccles Stadium. After finally being declared qualified for the race after a controversy in which he was accused of throwing a race so that teammate Shani Davis would qualify for the Games, Ohno found himself involved in on-ice struggles that certainly merited Olympic-sized proportions. 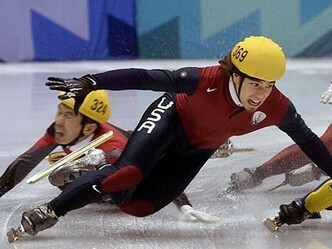 After a disqualification in the 500-meter race, he was leading the skaters in the 1,000-meter competition before he and three other skaters all fell in a series of collisions on the final lap. Steven Bradbury, representing Australia, skated past the pile with ease to win the gold medal, becoming the first person from the southern hemisphere to win a gold medal at a Winter Olympics. Ohno scrambled to his feet and crossed the finish line to win silver. The 1,500-meter race was even more messy on the ice and politically. Ohno won gold, but only after first-place finisher of South Korea’s Kim Dong-Sung was disqualified for blocking Ohno in a rule violation called cross tracking. Despite the disagreement of fourth-place finisher Fabio Carta of Italy and the protest of the South Korean team to the chief official — and later, the International Skating Union, International Olympic Committee and the Court of Arbitration for Sport — the IOC decided not to take action. The CAS determined that there was no provision in the short-track rule book for overturning a judgment by a referee. As a result, thousands of emails protesting the race results crashed the IOC’s email server, while thousands of accusatory letters, many of which contained death threats, were sent to Ohno and the committee. The controversy only fueled Korean anti-American sentiment, expressed over the airwaves and soccer, after U.S. President George Bush had named North Korea as one of three members of the Axis of Evil, upsetting many South Koreans. Since his turn in Salt Lake City, Ohno has won… read the rest of the story on KSL.com.